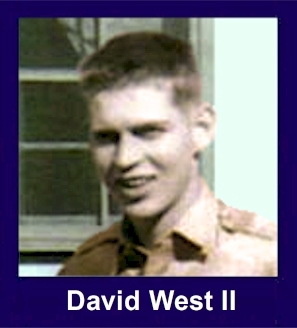 The 35th Infantry Regiment Association salutes our fallen brother, SGT David Lee West, RA15288301, who died in the service of his country on June 8th, 1951 in South Korea. The cause of death was listed as Seriously WIA by missile-Died of wounds (FECOM). At the time of his death David was 21 years of age. He was from Cabin Creek, West Virginia. David's Military Occupation Specialty was 1812-Heavy Weapons Infantry Leader. The decorations earned by SGT David Lee West include: the Combat Infantryman Badge, the Purple Heart, the National Defense Service Medal, the Korean Service Medal, the United Nations Korea Service Medal, and the Republic of Korea War Service Medal. Sergeant West was a member of the 35th Infantry Regiment, 25th Infantry Division. He was seriously wounded by the enemy in South Korea on June 6, 1951 and died of those wounds on June 8, 1951. Sergeant West was awarded the Purple Heart, the Combat Infantryman's Badge, the Korean Service Medal, the United Nations Service Medal, the National Defense Service Medal, the Korean Presidential Unit Citation and the Republic of Korea War Service Medal. graveside rites will be conducted by the West Virginia Military District Headquarters of South Charleston and American Legion Post No. 80, of Cabin Creek. frozen in service when his tour of duty expired. 1950. He was a graduate and popular athlete of East Bank High School, and was captain of the 1947 basketball team. Surviving besides his parents are: three sisters: Mrs Jack Noel of Pratt, Hannah and Barbara West at home; two brothers, Charles of St. Albans and Jerry at home; his grandmother, Mrs Julia West of Sylvester and Mrs Catherine Creasey of Cabin Creek.